Stay along the E4 motorway at a hotel that's had a facelift. 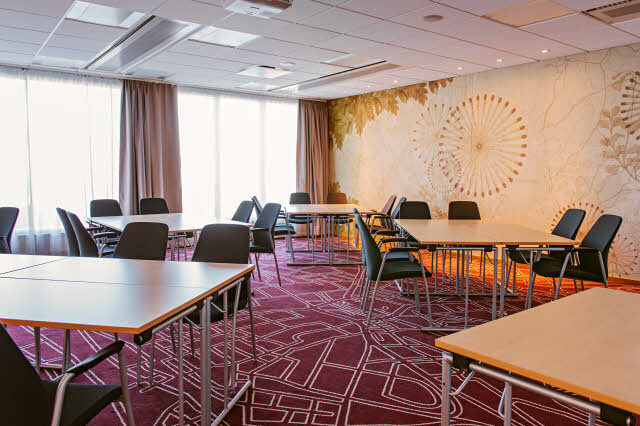 We have modern meeting facilities and accommodation close to the Elmia fair and congress centre, where we are also able to offer conference rooms for up to 1,000 people. Enjoy a delicious meal in our Köksbaren restaurant and challenge your colleague to a game of pool. Scandic Elmia has had a facelift. Relax in our sauna, keep fit at our gym or stop by Rosenlundsbadet leisure centre, located next door to our hotel with water park and spa. We can also help you arrange successful meetings or conferences. Our 13 modern meeting facilities can accommodate up to 100 people and we offer free WiFi and free parking. Feel at home in our Köksbaren restaurant, where we serve food with a quality rarely seen in roadside restaurants, including our delicious Scandic Classics. We want you to feel right at home, so sit back in front of the open fire or challenge someone to a game of pool. Scandic Elmia is centrally located in Jonkoping along the E4 motorway, close to the city's entertainment and attractions, and only 50 metres from Kinnarps Arena. Take the opportunity to visit some of the popular sights around Jonkoping, including the old town of Granna and Visingso island. We serve delicious food with a quality rarely seen in roadside restaurants, including our popular Scandic Classics.